Have you ever had a day when you just can’t seem to curb those cravings for sweets? How about a night when you find yourself raiding the kitchen cabinets? Rest assured–you’re not alone! All of us have specific hormones in our bodies that influence appetite. Two of the strongest hormones that function as appetite regulators are leptin and ghrelin. 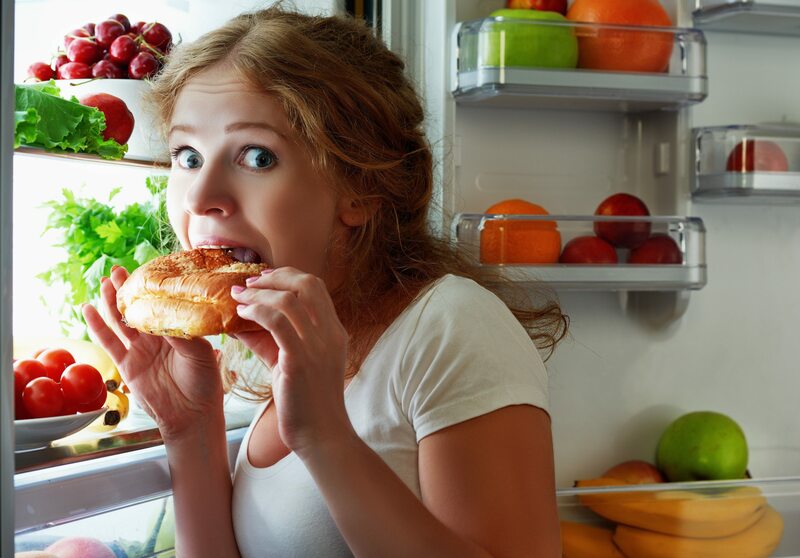 While we still have a lot to learn about them, knowing how these hormones are affected by food is helpful when trying to achieve a healthy weight and manage food cravings. Leptin is a hormone that is produced by the body’s fat cells and helps regulate bodyweight by suppressing the appetite. It is called the satiety hormone because it provides the feeling of fullness after eating a meal and causes you to stop eating. The more body fat you have, the more leptin your body will produce. Over time, however, high levels of leptin can lead to a condition called leptin resistance which causes a person to no longer recognize that signal of fullness. (1) The good news is that leptin resistance can be improved with diet and exercise. What can you do to help control these hunger hormones? Research supports that what you eat and when you eat impacts how leptin and ghrelin work. Here are seven tips to help stabilize these hunger hormones, minimize cravings, feel satisfied, and improve leptin resistance. Incorporate high-quality protein-rich foods at meals, starting at breakfast. Compared to carbohydrates and fats, protein is the most filling nutrient. Studies show that protein reduces ghrelin levels so you don’t feel hungry and increases leptin to help you stop eating. (2, 4) Aim to get 15-35 grams of protein with your meals. Consume omega-3 fats to improve leptin resistance. (5) Foods rich in omega-3 fats help leptin work better in your body. Good sources of omega 3 fats are fatty fish like mackerel and salmon; nuts, especially walnuts; flaxseeds and hemp seeds; cod liver oil; egg yolks; and avocados. Eating fish twice a week, snacking on nuts 4-5 times per week, and adding avocado to your morning eggs are ways to boost your intake of omega-3s. Include foods that are high in resistant starches at each meal. Resistant starch is a type of carbohydrate that is resistant to digestion and supports healthy gut bacteria. Examples include lentils, oats, sweet potatoes, and green bananas. Resistant starches suppress the appetite by boosting leptin production. Commit to regular exercise. Exercise is proven to increase levels of leptin and improve leptin resistance. (6) If exercise is new to you, start with 15 minutes of walking or biking two to three times per week and gradually increase until you are able to exercise 30-60 minutes most days of the week. Consider hiring a personal trainer to help you get started and stay motivated. To learn more about how to control your hunger and cravings, make an appointment with one of our registered dietitians at the club nearest you. Click here to request an appointment. Friedman JM, Mantzoros CS. 20 years of leptin: From the discovery of the leptin gene to leptin in our therapeutic armamentarium. Metabolism. 2015;66-68, 147. Adamska E. Ostrowska L, Gorska M, Kretowski A. The role of gastrointestinal hormones in the pathogenesis of obesity and type 2 diabetes. PrzGastroenterol. 2014;9 (2): 69-76. Skelton JA, DeMattia L, Miller L, Olivier M. Obesity and its therapy: From genes to community action. PediatrClin North Am. 2006;56 (4): 777-794. Schwarz NA, Rigby BR, La Bounty P, Shelmadine B, Bowden G. A review of weight control strategies and their effects on the regulation of hormonal balance. J NutrMetab. 2011;237932. Abete I, Parra D, Crujeiras AB, Goyenechea E, Martinez JA. Specific insulin sensitivity and leptin responses to a nutrition treatment of obesity via a combination of energy restriction and fatty fish intake. J Hum Nutr Diet. 2008; 21 (6); 591-600. McCulloch, M. Appetite Hormones. Today’s Dietitian. Vol. 17 No. 7 P. 26. Ashley Cappel is a Registered Dietitian at the Midlothian and Swift Creek American Family Fitness locations. She holds a B.S. in Food and Nutrition from Western Kentucky University and completed her dietetic internship at VCU Medical Center in 2010. Since earning her credentials in 2011, she has helped busy professionals, parents, children and young adults make dietary changes to improve their health and performance and to reduce their risk of disease. Ashley’s experience includes adult and pediatric weight management, endocrinology, eating disorders, allergies and bariatric surgery. Ashley also has diverse experience as a contributor, interventionist and dietitian for several weight loss research studies in Richmond, VA. Send Ashley an email to schedule a nutrition counseling appointment.